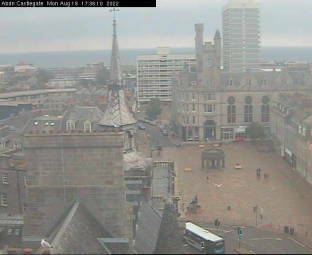 Webcam Aberdeen: Aberdeen Castlegate - A view over the city. Aberdeen: Aberdeen Beach, 1.1 mi. Kintore: River Don at Kintore, 10.9 mi. Ellon (Aberdeenshire): River Ythan at Ellon, 15 mi. Banchory: River Feugh at Banchory, 16.4 mi. Potarch: Potarch Bridge, 21.5 mi. Dinnet: Deeside Gliding Club - Parking Lot, 28.4 mi. Turriff: River Deveron at Turriff, 30.7 mi. Laurencekirk: River North Esk at Laurencekirk, 30.7 mi. This webcam Aberdeen with the theme City Views was added on April 18, 2005 and is operated by Aberdeen City Council. It got 67484 visitors since then. Shouldn't this webcam work or should the link be wrong please report that here. You can add this webcam here to myCams.